The Automobile Club of Southern California is alerting motorists that a recall of certain Chrysler, Dodge, Fiat, Jeep and Ram vehicles will be under way soon to remove defective vehicles from the road by offering trade-in incentives and a buy-back program. The U.S. Dept. of Transportation’s National Highway Traffic Safety Administration (NHTSA) announced that under a consent decree Fiat Chrysler Automobiles (FCA) will pay a record $105 million in fines and penalties as well as buy-back certain truck models with suspension problems that could lead to sudden and unexpected loss of steering control. It also will offer discounts to owners who may wish to trade in older Jeep models. Due to the delay in how FCA responded in recent years to two dozen vehicle safety issues and the slow and low repair rates of its recalled vehicles, NHTSA issued the consent decree which the carmaker must legally follow. Fiat Chrysler also agreed to strict federal oversight and an independent recall observer to assess, track and report the company’s recall performance, according to news reports. Before contacting a dealer, owners should first locate their vehicle’s unique 17-digit Vehicle Identification Number (VIN) on the “VIN plate” at the base of the windshield on the driver’s side of the vehicle, according to the Auto Club Automotive Research Center’s Chief Automotive Engineer Steve Mazor. They should then type their VIN into NHTSA’s VIN look up page https://vinrcl.safercar.gov/vin/ to see if their vehicle is affected. They should also read about the buy-back program details in the consent decree on the NHTSA web site www.safer.car.gov For those who wish immediate information, there’s a toll-free phone line: 1-800-853-1403. In the case of the Jeep Grand Cherokee, recalled for a leaking fuel tank that has been linked to 75 deaths, an owner of an eligible vehicle can take their SUV to a dealer and trade it in for a new car. The trade-in price will be for a “fair market value” and the $1,000 incentive can only be used toward purchasing another Fiat Chrysler vehicle or dealer parts and services. If owners want to keep their eligible Jeep Grand Cherokee, Fiat Chrysler must give them a $100 gift card that can be used anywhere when the vehicle is brought in to be fixed, according to the consent decree. Recalls are utilized when a vehicle or item of vehicle equipment doesn’t comply with a federal motor vehicle safety standard. A recall also occurs when there is a safety-related defect in the vehicle or equipment. Owners who move should notify the vehicle manufacturer by using a post card many provide in the warranty booklet or by giving the dealer the new address so notices and other information can be sent to the new home, Mazor added. · Watch the mail. Mailed recall notices are now easier to identify. 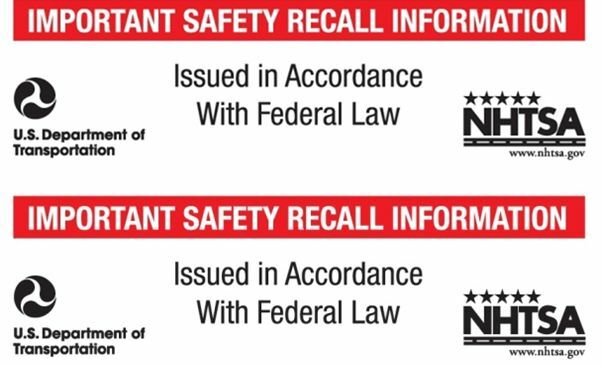 NHTSA requires all manufacturers use a distinctive label on mailings that notify owners of recalled vehicles or equipment. The label says “Important Safety Recall Information” in red and black, along with the phrase “Issued in Accordance with Federal Law,” and U.S. Dept. of Transportation and NHTSA logos. · Download a free app. The SaferCar app is available for Android, iPhone, iPad and iPod Touch, and helps consumers find recall information and up-to-date vehicle safety information, search the agency’s 5-Star Safety Ratings for vehicles by make and model, and subscribe to automatic notices about vehicle recalls, among other features. · Go online. At SaferCar.gov, consumers can go to a dedicated recall web site for the latest information. Consumers should check the web site periodically because more vehicles may be added to the recall list. Safety recall repairs are paid for by the manufacturer, regardless of warranty considerations, Mazor said, and manufacturers may voluntarily issue their own safety recalls after notifying NHTSA.